It’s a disease in which air passage in lungs get inflamed and thus result in improper breathing, chest congestion and coughing.it can be mild , moderate or severe, depending upon the frequency of the inflammation of air path.today 6 out of 110 people are suffering from this. Earlier it was said that asthma is a disease which can never be cured completely and it leave the patients only on their death. 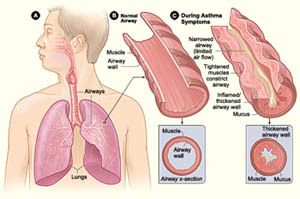 It is primarily a disease of the respiratory system.Here, the patients has more difficulty in expiration than inspiration.ther is a wheezing cough and a sense of suffocation.the attack of asthma may last for a few minute to a few hours or even days where in the patients is exhausted.It is common to all ages. suppression of negative emotions like jealousy, anger, resentment, hatred are often precipitating causes. Due to short breath, co2 is not expelled completely from the body. constipation and indigestion may be associated with accumulation of toxins leading to asthma attack. Signs & symptoms- premonitory symptoms are usually sneezing, nasal irritation and nose block. accumulation of mucus in the bronchi gives rise to obstruction in breathing that produces a feeling of burden over chest.Spasm may be present in chest leading to difficulty in breathing.patient gasps for breat & nails and lips become blue indicating less o2 supply. Difficulty in breathing make patient to sit in propped up position with support.exhaustion in breathing leads to sweating.distress and anxiety increase due to laborious breathing. EOSINOPHIL count in blood increases.Mucus secretion becomes thick and sticky.The chest becomes hyper expanded and the lungs hyper inflated.so the person has to do expiration with efforts which becomes very short.Inspiration is also shallow and short.Longer the struggle for breath, more is the severity of attacks, distress and anxiety.the asthmatic patient is unable to relax.H e is exhausted and develops the flexion attitude of the body in defence. CONCLUSION: It is caused due to chocked lungs, inflamtion in respiratory organs, blockage in nostrils etc.Patients should always keep distance from triggers like- pollen grain, pollution, animal hairs , diesel fumes etc. patients must keep healthy diet habbits and life style and never give up. There are inhalers and various medicines available for asthma treatment. however these medicines are rich in steroids, having alarming side effects.thus people are running for natural ayurvedic medicines. 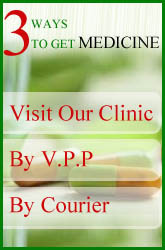 natural medicines treatment includes building the proper functioning of excretory organs. ADD CAMPHOR TO MUSTARD OIL AND MASSAGE ON THE BACK OF THE CHEST THIS WELL LOOSEN THE BREATHING ORGANS AND SUPPORTING BREATHING. Sun bath , steam bath helps in opening your lungs and increase breathing capacity. Intake of honey in milk or in luke warm water for detoxification of body and soften the mucus. Garlic rich food like garlic paste with milk or garlic tea is a very good remedy. Milk with turmeric powder.turmeric is one of the best medicine for cold ,cough & cancer. Intake of vitamin c and magnesium are good for asthmatic patients.vitamin e and calcium also works. Sprouted wheat, soyabean, dry fruits contain vitamin e is good for asthma. Intake of mixture of Fenugreek (meethi) and carom seeds (ajwain) boiled in water, filtered and this decoction mixed with honey.3 times a day can cure asthma. Eating everyday 1 betel leaf (pan), 5 basil leaves (tulsi), 1 cloce, with a pinch of camphor and fold it.it helps in curing asthma. Dry dates ( chuara) and dates (khajoor) both are helpful in giving strength to lungs. Intake of garlic juice with honey works in asthma. Intake of karela inmeals is good for asthmatic patient. Intake of burnt banana leaf with mixed with honey cures asthma.